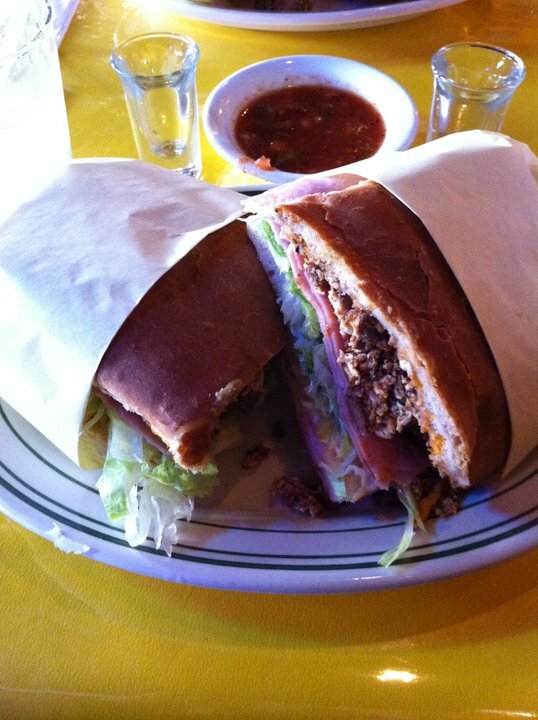 Los Dos Amigos in Thousand Oaks, CA has some of the best Tortas I have ever eaten. 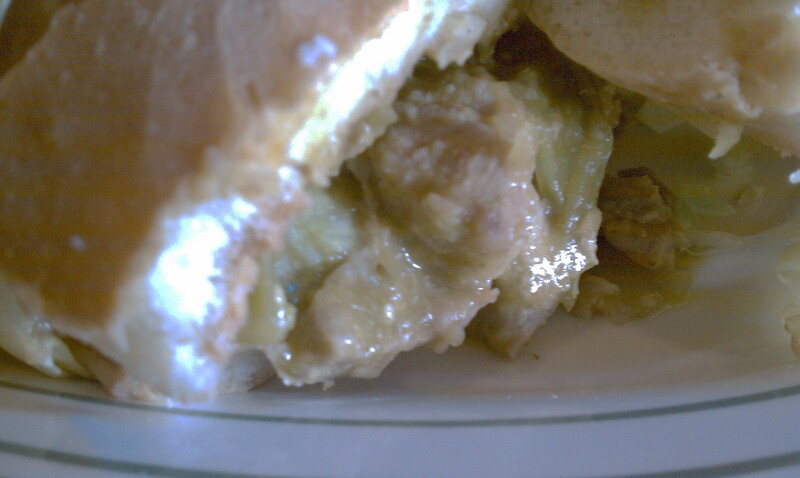 I ordered a Chile Verde torta which was very tasty. I love the bread that they use to make the tortas. It has a slightly crisp taste to it that I think goes well with all the “mushy” moist ingredients on the inside. 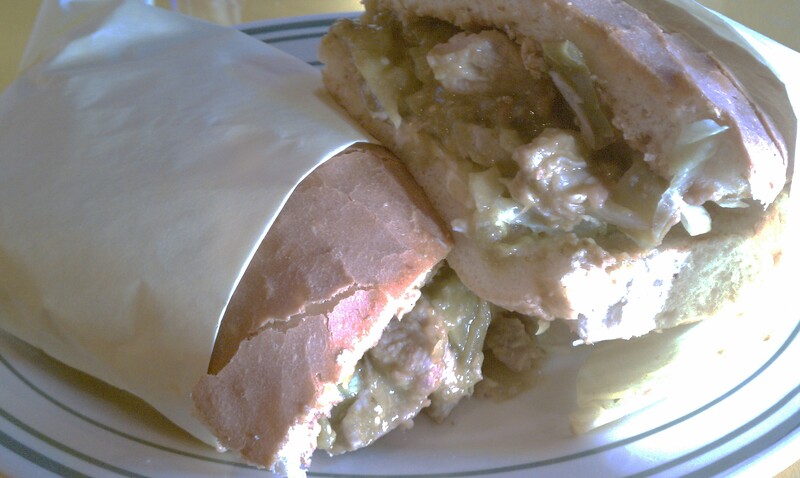 Along with the chile verde the torta comes with avocado, jalapenos, lettuce, cheese, mayonnaise and fresh onion. My lunch companion, and super-friend, Liz gave me permission to use her photo from her “La Torta Loca”. The sandwich is like a breakfast burrito, but only instead of a totilla you have a small loaf of white bread. It has ham, cheese, churrizo, scrambled eggs, and it all combined with the other added ingredients from the above sandwich. It is a moist and meaty delight, but was missing my favorite ingredients. The precious avocado and Jalapeno were absent from her sandwich. We, as unique human individuals, each have our own discerning tastes, and the part of me that can’t wrap my head around why people insist eggplant is delicous understands this simple philosophy. Yet still there is the a huge part of my stomach that weeps for the wasted avocado “butter” opportunity gone to waste….sigh..
That Torta Loca was so good. And I’m sorry I just don’t like avocados. Yay! Thanks for calling me your Super Friend! I feel like a superhero! This is really making me miss mexican food! So hard to come by in Canada. You have just reminded me that I am going to have to do a series on sauce!